CEDAR CITY— 2018 was another year of expansion and prosperity at Southern Utah University. With continued enrollment growth, building dedications, exciting new partnerships and academic accolades, SUU is building upon its reputation of excellence by soaring to new heights. With noteworthy stories ranging from university recognition to breaking records, here are the top 18 news stories from 2018. At the end of term for the 2017 year, SUU crossed the 10,000 student enrollment threshold, topping out at 10,245 students. The number marks three years of record enrollment growth for the 121-year-old institution. Following months of interviews with qualified candidates from across the country, SUU announced Dr. Schvalla Rivera as the new Assistant to the President for Diversity and Inclusion. Previously, Rivera was the Dean of Students at Western Nebraska Community College and is equipped with a diverse professional portfolio. 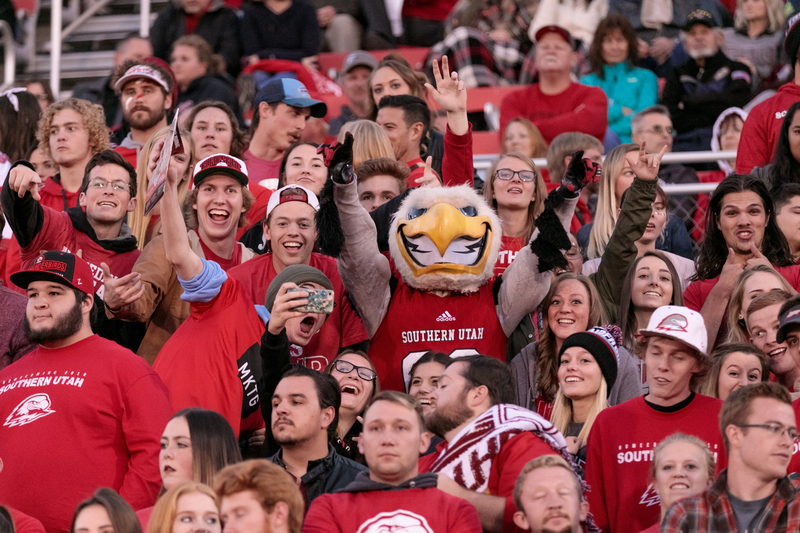 According to the Utah System of Higher Education, SUU leads the system in student enrollment in terms of percentage growth with a 7.69 percent increase last year. SUU is turning textbook theory into experiential learning through one of the nation’s few pigeon labs. The lab is used specifically for teaching undergraduate students the principles of behaviorism by providing live pigeons for each student to train as part of the course. Last fall, Jens Howe, a pre-physical therapy student at SUU, helped launch a noncontact boxing clinic for Iron County residents who are struggling with Parkinson’s disease. Howe has seen improvements in participants’ coordination, balance, flexibility and overall well-being. The boxing program isn’t a cure, but it helps slow the disease’s progression. According to the National Center for Education Statistics, while more than 57 percent of college undergraduates are women, only 18 percent progress into STEM careers. With a clear gap, Microsoft set out to better understand what causes girls and women to lose interest in STEM subjects and careers, as well as what strategies have the greatest potential to reverse the trend. Recognizing that traditional methods and high-priced textbooks pose a significant barrier for student success, SUU is working to make education more affordable and accessible. SUU celebrated the class of 2018 Thunderbirds – 1,868 graduates – during the 119th university commencement ceremony. The keynote address was given by Anne Leavitt, co-founder of the Leavitt Foundation. SUU has added three more titles to its impressive list of accolades earned in the past few years, winning Utah’s Best of State in the educational institution, curriculum development and volunteer service categories. With 33 possible categories, SUU is the only institution to receive multiple awards. The National Security Agency and the Department of Homeland Security designated SUU as a National Center of Academic Excellence in cyber defense education. SUU is the only public university in Utah to receive this designation. SUU and Cedar City hosted the Larry H. Miller Tour of Utah. Deemed “America’s Toughest State Race,” the Tour of Utah was a week long professional race for some of the best cycling teams in the world. Cedar City has been the start headquarters and Stage 1 host of the Tour of Utah four times, and SUU has partnered to provide the “Athlete Village,” bringing international cyclists and spectators to campus. Gov. Gary Herbert visited partners and participants in the Southwest Aerospace and Manufacturing Strategic Workforce Initiative. The initiative is a collaborative program that helps students develop skills that put them at the forefront of the rapidly growing aerospace industry. SUU has not only found a way to increase its first-year student retention but continues to build momentum and excitement across campus. In just two years, from 2015-2017, the university went from a stagnant 64 percent retention rate to 71 percent, a record high for the institution. SUU hosted a dedication and ribbon cutting ceremony for their new state-of-the-art business building. The building is 42,000 square feet and consists of 15 classrooms, 38 offices, study space, an investment learning lab, an entrepreneurship lab and an incubator space. Runners from around the world experienced a challenge unlike any other. The Grand to Grand Ultra race started at the north rim of the Grand Canyon, included seven days of running and camping, then finished at the summit of the Grand Staircase. The group dedicated this race as a fundraiser for the future Sorenson Legacy Foundation Child and Family Development Center. No. 23 women’s cross country team competed at the Big Sky Championship where the women claimed a title for the first time since joining Big Sky in 2012. SUU’s Michael O. Leavitt Center for Politics and Public Service and the Utah Debate Commission hosted the Utah Senate debate. Candidates Mitt Romney and Jenny Wilson clashed live on political topics ranging from immigration to Utah’s water problems. SUU’s head football coach Demario Warren was named in the 2019 American Football Coaches Association 35 Under 35 Leadership Institute, following his third season leading the Thunderbirds.